We visited our neighbors this weekend and as we were leaving they said something along the lines of “well pretty soon we can hang out outside and grill!” Mike and I looked at each other, realizing that not only do we have no outdoor “hang out” space, but we don’t even have a grill. 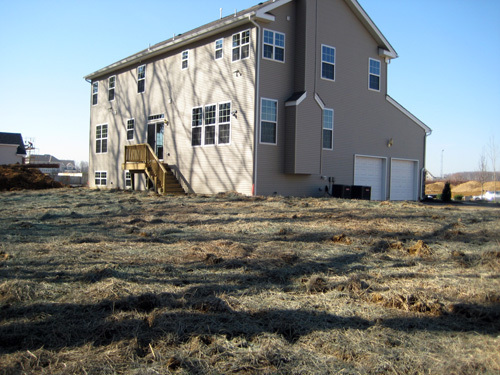 The back of our house still looks like this…. We put zero effort into thinking about this space. Well, realistically thinking for the near future. I have high hopes of a pool with a waterfall and slide, but I know that’s not likely to happen. I am not a good landscape/hardscape envisioner… I am still new at this part of homeownership. 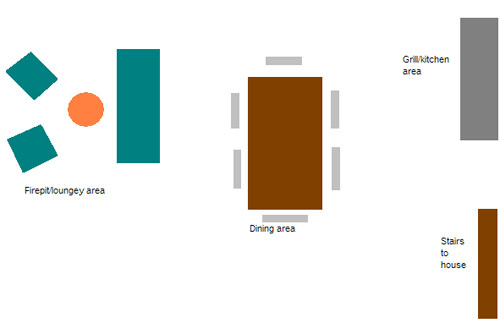 I can think of the “feel” and “mood” I’d like our outdoor space to have but as far as actual materials, layout, size.. I am clueless. After our neighbor’s reminder and the long and cold winter we’ve had, we started to think that this may be our big project of 2011. I love being outside when it’s nice out and sitting on the porch by myself got old quick last year. We originally thought we’d do a deck, but a) it’s expensive to do composite b) there’s maintenance involved with real wood with a dark stain and c) not sure if it would be the best place for my firepit dreams. 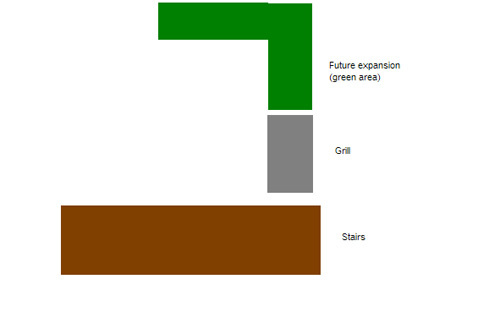 So then we thought (in our dreamland) that we’d do a deck with an eating space with stairs down to a patio with a firepit/loungey area. Then we decided that we didn’t want to eat up too much of our yard and want to keep our future options open. So we started to think about just going with the patio. I love the added texture in that last picture! Now, Mike and I can almost guarantee that this pattern and color will be the most expensive stamped concrete option in the history of the world… we just have that sort of luck. But we figure it can’t hurt to ask around. The next question we had to tackle? What size do we want. Wait, do you need a close up of the best part? I married such an artist. I think this will still be too big, considering the mass amount of dead space in the center, but hopefully this is just a jumping off point. We’re hoping to actually go outside to the backyard (what a novel concept!) to get an idea of how large we want this thing. We had an appointment with the concrete man for Saturday, but we had to cancel it because we forgot we had other plans. So hopefully, concrete man will come soon with tons of ideas, thoughts on maximizing our space and a cheap price! Robert knows (or knew) someone who does that kind if concrete coating down here. Love it! I don’t remember if he told me they did wood-look, it it that is incredibly awesome. Also? 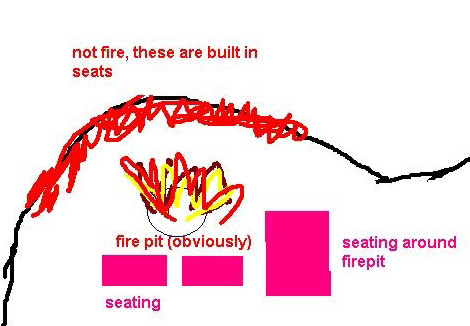 I LOVE the paint wars and the “firepit (obviously)”. Can’t wait to see what direction you go in! Whoops, I meant “kind of” not if. Just an FYI- we did our composite deck for <2000 I believe and it is a decent size for eating/grilling. It helped that Brian did all the labor, but we found composite through a contractor warehouse place for half the price Home Depot/Lowes wanted. Hm that’s good to know! But I’m not sure, I’m feeling patio lately. I think I have to go stand out there and think it through! love the wood patterned concrete. love your paint drawings. LOVE, LOVE, LOVE that stamped concrete. I did not know something like this even existed!! I swear my style has changed in just a year! There are probably a couple of little things we would have done differently if we had to do it all again! 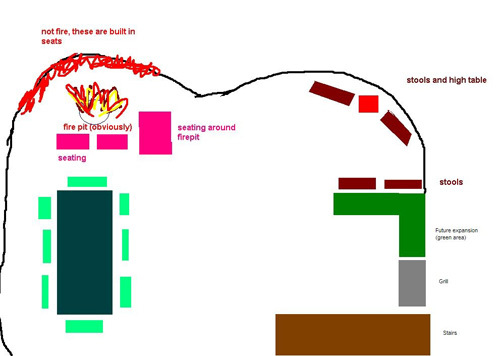 ahhhhh designing the backyard! fuuuun!!!!! I want a david bromstad-esque deck and patio… omggg have you seen the ones he’s done on colorsplash? faaaaabulous! happy designing/planning love! can’t wait to see more! i am loving that stamped concrete. i’ve never see that patter before! i’m going to have to show my fiance. our yard is still completely mud so we are trying to decide what we are going to do before they lay our sod next month. good luck with your ideas! love the drawings by the way. 🙂 haha! 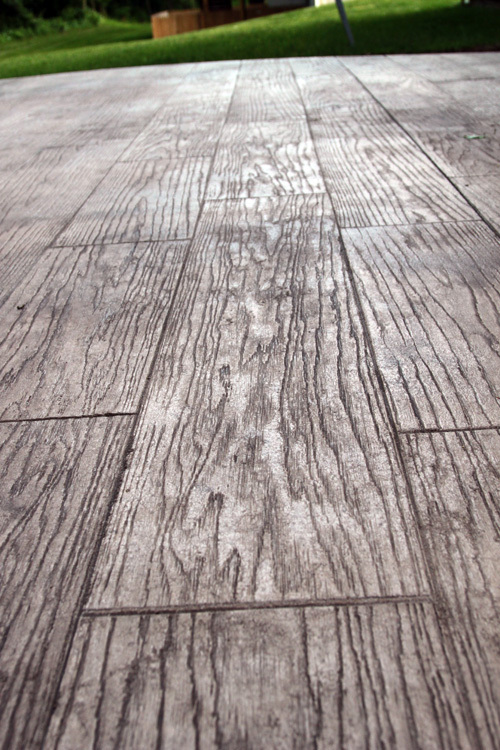 Love the stamped concrete made to look like wood! 20 years ago we built our home and had stamped concrete in the kitchen (mexican tile look) and the living room (black slate). Everyone thought we were nuts, turned out great and never regretted it! I’m going to go with – I don’t know about the stamped concrete. It’s one thing to look at pictures of it on the internet, but I imagine in reality it will never feel like wood underfoot therefore would appear fake. If you like concrete, why not go for a polished concrete made with aggregate that polishes up as beautiful speckles? Personally I would do an outdoor tile or paver over stamped concrete any day. I love the stamped concrete! Where would I get the stamp to do that? Please email me the information….I want to do that on the floor of my new log cabin! Awesome. I sent you an email, but I figured I’d respond here too just incase anyone else has a similar question. Our patio is about 700 sq feet so we did not pour all of that concrete on our own! Once we knew we wanted the wood plank, we googled for a local concrete company that had that stamp. Thankfully we found someone very local who was excellent. But if you’re looking for just the stamp, I’d say try google since I did spot it when I was just wondering what the heck it looked like. Where can I get the stamp to do my deck! We contacted a contractor who had the stamp and he did all of the work. I literally just searched for “wood plank stamped concrete near (zip code)” and loved who we found! This is AWESOME!!!!!!!!!!!! I soooooooo want to do this one day!!! Just found your blog through Pinterest. 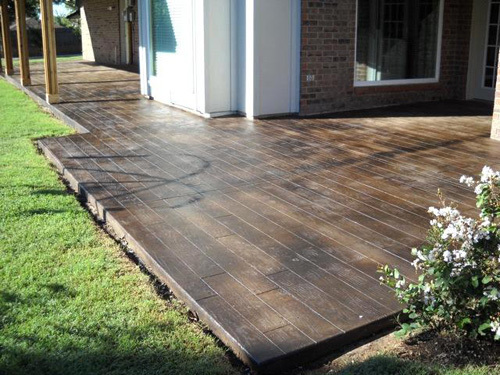 I have never seen the wood pattern stamped concrete…I LOVE IT! Hope you share your final outcome! I came to your blog via a picture on pinterest (a couple, actually). It looks AMAZING! Makes me want to grind up our patio and start over. 🙂 Thanks for sharing! I am thinking about using this in my kitchen. i love dark wood but concrete is easier with three dogs and future kids. do you think it could work indoors? Possibly! I think it would look awesome but I’ve never had a concrete floor indoors so I’m not sure what the process would be like! These floors look great! I wonder if you can put underfloor heating under them and use them inside the house. We have stained concrete floors in our house and we love them. I have heard of putting heating under them but we did not go that route. We love them and will never have carpet or anything else in a home again. Yes, my son just built a house with heat contrete floors and they love it. Had line cut in the concrete to make it look like tile and then have them stains and grouted the groves looks great and the heat feels good on the feet. Just wondered how expensive this is – thinking about doing it in a firepit area? Thanks! Hi Susan, it’s usually less expensive than pavers, though a small area may cost you more as contractors generally mix the concrete in large quantities. When we priced everything out, we googled and saw that estimates could range from $8-$16 sq/ft. I’m not a big fan of stamped concrete or concrete at all, for that matter. I prefer pavers. That’s what we mainly install. But I have to say that’s one of the most unique and creative varieties of stamped concrete I’ve ever seen. One thing that concerns me is the control joints, or lack of. I did see one photo where I could make out an obvious control joint. And they hid it well – going along the grain of the wood. But in a patio that size, you’d typically have control joints going both directions. So with fewer control joints, that’s a potential problem. I suppose if you spend more time on base prep. and use a lot of rebar or a rebar grid and float your rebar half-way up into the concrete, then maybe you could get away without doing as many control joints. But that’s always my concern with concrete – cracking. And control joints is what helps mitigate that. So without as many, that’s a little risky. 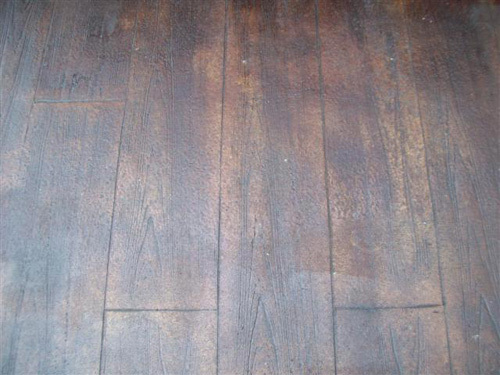 Hi….I have found several different posts of this stamping and would love to find someone to do our unfinished cement basement floor. I am in Utah and am wondering if this is where ur too…..if so can u give me a recommendation of the contractor u used? Thanks! Unfortunately we’re in NJ 🙁 we just googled around and LOVED our contractor! Wow, it’s amazing how far concrete has come. It’s like everything that was once utilitarian became artisan. I’m with Jim I really worry about concrete but we have some heavy winter action here in Rochester NY. I wish you the best with this it looks great. I love this idea…thanks for sharing it. Would love to know if you know of a contractor in Houston! Or…maybe your contractor knows of one. Too awesome! Sorry I don’t, but we just found ours through Google! I live in NJ too. Can you give me the name of your contractor? He did a great job. I absolutely love it! I would love to do this for the inside. I was wondering if this is done when you poured the cement or later? Bc our cement is already poured. Thanks! Anyone know contractors in the Philly area that can do this? I just answered above since I’m behind on responding to comments on this post, but our contractor is based in South NJ outside of Philly if that’s where you are! Can this be done over concert already down?? Can this be accomplished on old concrete? I don’t believe so, they stamped the concrete while it was wet. Stencilling can definitely be done on old concrete;-)! I live in a house that is 90 years old just a little north of Detroit. I had my front porch and walkway done in poured patterned concrete 15 years ago. It looks like limestone and the contractor matched the color to the limestone on the front of the house. They did an amazing job and I love it. My advise is to find a contractor who has been doing it for quite a while and has been in the concrete business for a long time. I think you will find it to be amazing, easy to care for and just about perfect in every way. My friends did their kitchen counters in concrete probably ten years ago, they still look great and they still love them! How much did this project cost you? I’m look at building a deck and would love to do this instead! My mistake! I have a concreter at my house right now and he has just confirmed that ‘stamping’ can only be done on fresh, wet concrete. Stencilling can be done on old concrete. So, back to looking at designs for me:(! Wow!! So awesome. Just curious – since it is darker in color does it get really hot?? I am in CA and the large amount of grey aggregate around our pool is already hard to walk on in the heat but I love this idea (i jut think it may look funny in a “light” color. Congrats on finding such a great idea!! We did ours lighter for that reason. Our contractor told us it would get ridiculously hot. At first I wasn’t happy with the lighter color but once we put our dark wood furniture on it, it looked great! I have been doing a Google search for quite some time now looking for ideas of how to fabricate molds (forms) to make patterns like this for our charitable organization. We are located in South East Asia so many things Americans take for granted is just not available to us. Any help my friends here can offer would be greatly appreciated. This wood pattern fits right in with the design of our traditional one room schoolhouse that goes back hundreds years in the US. We are attempting to bring a little American history and tradition to the Philippines and maybe one day on into other parts of South East Asia. I just saw this on Pintrest and I think it looks amazing!!!! We have almost all tile on our lower level of our house and were thinking about paving over it and doing some sort of concrete technique. You have given me hope that I don’t have to live with this white tile the rest of my life:) With 2 sets of twins 4 and under this white tile will be the death of me, ha!!! Rebecca I just now saw your post. Very interested in this. What area of the country do u live in? Curious about who u hired to do it actually to see if they are anywhere near me. Do you know the name of the color they used? Rebecca- I am in nj too (red bank area) are you close? If so would like your guys contact info! Love it!! This is perfect for Puerto Rico or for that matter any of the islands inside or outside of the home because of termites etc… Is it a diy you think? Love the dark color! Please share the color! I So Love this! I wish I had known about it when we built or house. We have a wrap around concrete porch.. To me it is ugly. I Love the porch…. the concrete just makes my house look unfinished! I wonder …. can mine still be done like that or am I stuck with the ugly Unfinished Look? I saw a photo of this style last year and got an estimate but went with an indoor project instead. I thought about it ALL YEAR and now am just waiting for it to warm up enough to pour! I live in Denver, CO. I have a great landscape company. I will let you know how it turns out! Nicely done! Beautiful job. Makes you want to hang out outside all the time:). We have a log cabin that has a heated cement floor with just the bare concrete look. Looking to do something to make it look like wood floor. Guess stencilling is only thing I can do now with it. 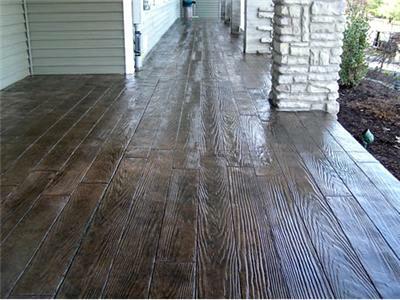 The pictures i have seen of the woodplank stamped concrete are great! I hope my douther in Great Falls (Montana) wil use this techniek too. Here in the Netherlants (Holland) Europ is this techniek onnown, sad to say! Wisch some wane did this overhere! My husband helped his friend who is a concrete contractor do this when we added on a large covered patio out back of our historic red brick home. It was awesome, and I love it! We had the cement dyed, where the dye is mixed in with the concrete and then used a mixture of brown and a little black stamping powder. It looks beautiful, and once you seal it, you can just spray everything off of it, (BBQ sauce). Our Outdoor kitchen with a 20 foot raised bar over the counter, sink, and grill makes it perfect for parties. We have great times with our neighbors and friends! Thank you for sharing this great idea! I love it! 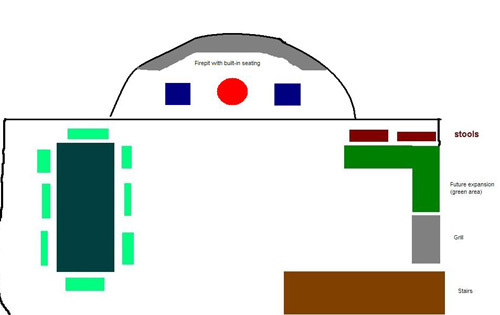 This next message is for Niki…or anyone else who likes this idea for indoors. There are several tile companies who now sell a wood plank tile. I helped a client with a remodel. She used a darker wood plank tile, and still loves it a few years later. My husband and I are now building a Cape Cod home in Utah. We are going to use the wood plank tile on most of the main level of our home. Due to the snow, and the lovely white color that remains after the snow dries, I have chosen a lighter color. It will show less dust and dirt. Wow! That looks fantastic. We have “cobblestone” stamped porch and patio floors. This would be amazing for a garage or basement floor. Amazing! I love this patterened concrete. My backyard is an emabarassment and my husband and I can’t agree about a hardscape (wood or stone). This is like the best of both worlds! I have to find someone in my town who can do this. Good Luck with your project. I am also disgusted 7 embarrassed about my back yard! 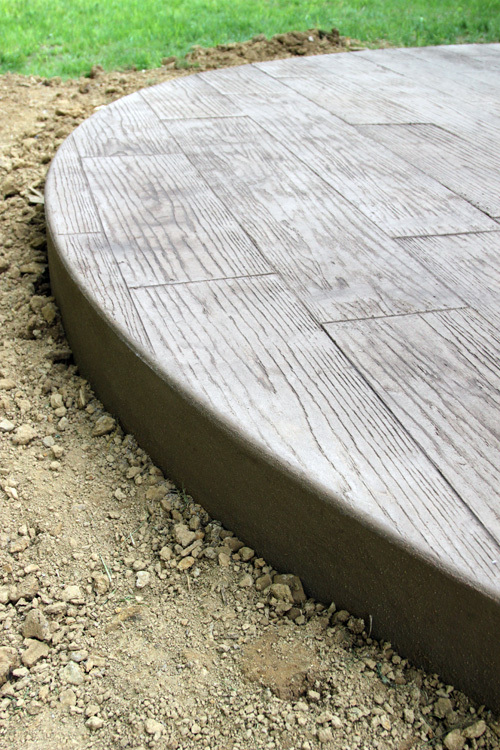 I need to do this this summer, please tell me where I could find stamped concrete like this! We just googled around for someone in our area who did the hardwood stamp! Found you via Pinterest and the wood stamp on the concrete looks amazing! Does anyone know what the actual colors that are used in the wood plank on the first, second or third picture above? sorry if it was mentioned, what is the approx cost per sq ft.? Hello there! This post couldn’t be written any better! Reading this post reminds me of my good old room mate! He always kept chatting about this. I will forward this write-up to him. Fairly certain he will have a good read. Many thanks for sharing! hey there and thank you for your information – I have definitely picked up anything new from right here. I did however expertise a few technical issues using this site, as I experienced to reload the site lots of times previous to I could get it to load correctly. I had been wondering if your web hosting is OK? Not that I’m complaining, but sluggish loading instances times will often affect your placement in google and could damage your high-quality score if ads and marketing with Adwords. Anyway I’m adding this RSS to my e-mail and could look out for much more of your respective intriguing content. Ensure that you update this again soon.. I wanted to compose you the bit of remark just to thank you so much as before considering the amazing views you have contributed in this article. It has been so particularly generous of you to deliver easily precisely what most of us might have sold for an e book to make some bucks on their own, especially considering that you might have done it if you ever wanted. Those basics as well served to provide a great way to know that many people have a similar zeal really like my own to know many more with regard to this problem. Certainly there are thousands of more pleasant times up front for individuals who examine your blog. magnificent put up, very informative. I ponder why the other specialists of this sector don’t notice this. You should proceed your writing. I am sure, you’ve a great readers’ base already! This is so cool, finding a good materials so as good constructor is also a plus. I remember one time when my friend is really pissed because the renovation in his backyard wasn’t what he expected, the materials that his contractor suggested isn’t as satisfying as he expected and this result to more money than he planed. Searching for net for design or suggestion is also a good idea, blogs like this really help some people who are wondering what to do in some part of their home. Mostra de construção de pedras artificiais construidas por mim no Brasil. I love this stamped concrete style! We have flagstone pattern stamped concrete on our back patio, under a pergola and a walkway that leads from the front yard to the back patio. If I had seen the wood grain style I’d have tried to get that under the pergola for sure. The only caution I have to offer is the glaze used to stain and seal the concrete gets very slippery when wet or icy. We live near Lake Ontario and the winters are – well, you’ve probably seen the news. No need to explain that any further. I don’t even attempt to walk on the concrete during the winter for fear of breaking something valuable – like an ankle or my skull. If you live someplace where snow and ice is a part of your lives, ask your contractor if there is anything he can add to the sealer that won’t affect the looks, but will add some traction when it’s wet or icy. Has anyone tried this in an in-ground pool deck with an anti-slippery seal? Is it safe? Any ideas where I can find this particular stamp and contractors in tri-state area (NJ)? These concrete patios look absolutely amazing and will stand the test of time much longer than wood would. Remember that concrete can be repaired and lifted back into place if it sinks! Love the wood look! Great color choice for the patio. It couldn’t have been done better! This was really a cost effective idea to have the space enlarged by filling it up with the beautiful wooden pattern! As someone who has experience with stamp concrete I can tell you that the detail in the wood grain on this stamp is flawless. Very tight work, sadly most of the stamp work out there is not to this level.